Looking back over the last twelve months I can see that I’ve been lucky enough to attend a number of awesome shows, festivals, etc, this year, with the last couple of months in particular being an incredibly busy (not to mention fun) period, especially where frantic, fret-melting technicality is concerned. 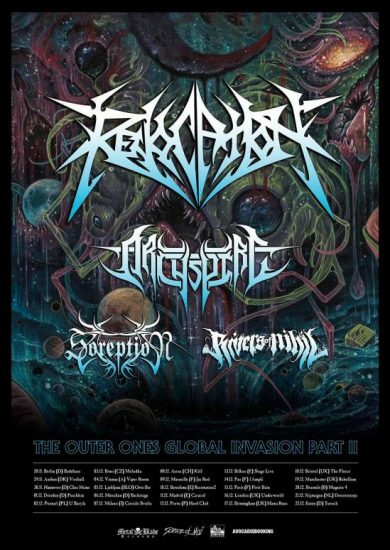 Just in the last few weeks I’ve got the chance to catch Beyond Creation/Gorod prog out and Aborted/Cryptopsy blast faces, and two nights ago saw things get kicked up yet another notch with the fatal four-way of Revocation, Archspire, Soreption, and Rivers of Nihil at Mama Roux’s in Birmingham. With the night’s bill so stacked and with little time to spare (goddamn traffic) the three of us – myself plus Beyond Grace guitarists and committed tech-aficionados Tim and Chris – still managed to make it to the venue early enough to catch Rivers of Nihil’s opening set, and we were not disappointed by what we heard and witnessed. As the only one of our little group who’d actually seen RoN before I mostly knew what to expect from the Pennsylvanian quintet, but even I was impressed by just how brilliantly tight and melodically nuanced their set was (with special mention going to the co-MVPs Adam Biggs and Jared Klein, whose riveting rhythmic performance held everything together perfectly), especially the band’s new material, which made up three-fifths of their set and which served to add an elemental freshness to their already aggressive-yet-atmospheric sound. Granted, the band haven’t quite settled on a smooth way to fully realise every aspect of the more progressive approach found on Where Owls Know My Name (the clean vocals in “A Home” were notably absent, while it’s a shame that the saxophone on “The Silent Life” had to be relegated to the backing track instead of, say, replaced with a second guitar solo… although kudos to the guy in the crowd rocking along to that section on his neon-yellow inflatable sax) but in terms of sheer intensity and skill you can’t knock the power and precision displayed during killer cuts like “Death Is Real”, “Soil & Seed”, and “Sand Baptism” (my personal favourite). Make no mistake about it, I only foresee bigger, better, and brighter things for Rivers of Nihil in the future. The most anticipated band of the evening, for me at least, were Sweden’s most-savage sons in Soreption, who were easily the heaviest of the four acts, despite being the only one operating with just a single guitarist. Now even though this was to be my first time seeing the band live, my history with Soreption goes back over ten years to when I accidentally stumbled across their debut EP, Illuminate the Excessive, in a local CD store (remember those? ), a disc which I still have in my collection and which I still spin to this day. And while the band didn’t play anything from this particular release this evening (with the majority of their set dedicated to material off their rifftacular new album Monument of the End, which, unfortunately, the band had completely sold out of at the merch table… thanks Ed! ), the inclusion of two absolute classic cuts – the phenomenal “Breaking the Great Narcissist” and crushing closer “March of the Tyrants” – meant that the evening’s festivities didn’t ignore the group’s early years. Now, on occasion, the lack of a second guitar was a little noticeable, but the punishing pace and machine-like precision with which Mikael Almgren cranked out every angular, shrapnel-spitting riff more than made up for any small gaps in the band’s sound. So if you like Technical Death Metal (and why wouldn’t you?) make sure you don’t miss these guys, as they’re still one of the absolute best in the business. Up next were those crazy Canadians in Archspire, and it quickly became clear, as the venue started to fill up and the band’s intro track – an excerpt from the legendary Naked Gun, which eagle-eyed audience members might have noticed was actually playing on a laptop behind the band during their entire set – began, that most of the crowd were there to see them over any of the other bands performing this evening. And, wouldn’t you know it, they absolutely stole the show with a performance that wasn’t just ridiculously fast, ridiculously technical, and ridiculously tight… but just plain ridiculous all round. Of course while much of the attention lavished on the band has focussed upon the rapid-fire, rap-like delivery of vocalist Oli Peters and the stunning shreddery of guitarists Dean Lamb and Tobi Morelli – and with good reason, because the combination of these two factors is a stunning sight to behold – it was the superior songwriting which underpinned last year’s ultra-punishing Relentless Mutation which demonstrated that the Canadian quintet have much more going for them than just high-velocity gimmicks, and tonight’s performance really hammered that home. Because, while the venom-spitting vocals and furious fretboard wizardry were undeniably impressive, it was in fact the moodier and more melodic moments, such as the brooding, bass-led prog-parts of “Relentless Mutation” and the haunting bridge of “The Mimic Well” (which you can check out below) which really stood out and showcased just how intricate and intelligent the band’s writing can be. Of course if you just wanted razor-wire riffs and chunky, neck-wrecking heaviness then Archspire were more than happy to oblige, closing things out with a rampaging rendition of “Remote Tumour Seeker” that left an indelible impression on the assembled audience and sent several of them careening straight towards the merch table as soon as the band’s set was over. With a rougher, rawer, and thrashier, sound than any of the other bands on the bill, headliners Revocation brought a much more down-to-earth, albeit still tight and technical-as-hell, angle to the evening, although the sound (at least for the early songs) didn’t necessarily do them any favours. Focussing primarily on tracks from their newest album, The Outer Ones, which sees the quartet leaning more and more towards the Death Metal side of things – more Malevolent Creation than Metallica, as it were – this was an even heavier, even harder-edged version of Revocation than I’ve seen before… so heavy in fact that “Communion” (introduced, aptly enough, as “the faster song we’ve ever written”) actually blew the power in the venue, forcing things to be put on hold for a few awkward, worrisome minutes before things were finally able to resume. Against all the odds, however, it actually felt like the power cut did the band some good, as although the quartet were clearly giving it their all in the early part of their set (even to the point of pulling RoN vocalist Jake Dieffenbachup onstage for a riotous rendition of “Madness Opus”), everything after things restarted somehow sounded just that little bit sharper, that little bit more energetic, and (most importantly) that little bit clearer than what came before! Now both my colleagues and I agreed that the group’s set did start to drag a little bit around three-quarters of the way through, but by closing with a climactic combo of “Chaos of Forms” and “Witch Trials”, two of the band’s most technically demanding and impressively intense numbers, Revocation definitely ended the evening on a high note, although it has to be said that, in the judge’s final decision, it was Archspirewho were the night’s real champions. I can attest to archspire’s live proficiency, saw them twice in Melbourne and they were beyond amazing. My wife can’t stand metal, and still talks about their set to this day, In particular their musicianship. Bravo guys. Sounds like a great show. The only one of those bands i’ve seen is Revocation, whose latest 2018 album is very good.